CoLab Radio » Blog Archive » We’re Mapping Resistance: Are you interested? We’re Mapping Resistance: Are you interested? 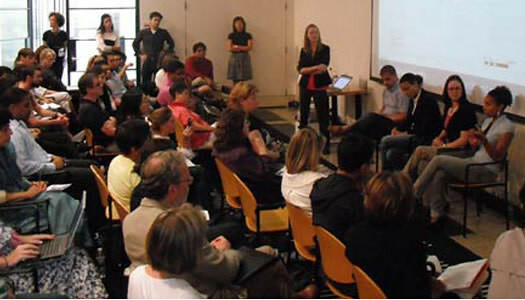 In 2009, a group of 20+ MIT students, faculty, and CoLab staff worked together to map out and deeply understand how the disbursement of the stimulus plan (the American Recovery Reinvestment Act – ARRA) was taking place. The diagram ended up in the hands of a Congress person and several CoLab affiliated groups won funding based on strategic decisions informed by the final report. The situation this time is different, but we’re getting started and see an opportunity to contribute. Our goal is to collect data about and then map resistance in preparation for the political realities of 2017. We’ll be looking at physical, financial, and social resources. The team will be students & faculty (MIT and non-MIT), CoLab staff, and potentially other partners. The outputs aren’t yet defined, but CoLab has word that at least one large organization thinks this information is going to be a very important resource. It’s still early, but we’re taking pulse check: Are you interested in keeping updated about what’s happening with this newly-forming initiative? Are you interested in contributing to this initiative? If the answer to one or both of those questions is “yes”, please fill out this very short form (name, email address, and how you’d like to be involved if you already have thoughts). I don’t know how I can help yet but am interested in contributing. Please keep me informed. I am a former DUSP faculty member. I think this is crucial project, we need to prepare for the battles that will be engage in the next years. Very interested in participate on it. Keep me posted.